The R&S®NRVD performs power, level and voltage measurements from DC to 40 GHz. 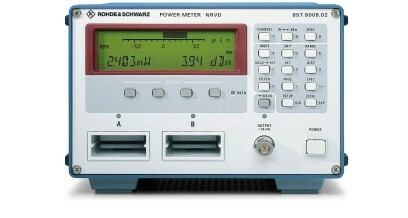 The R&S®NRVD performs power, level and voltage measurements from DC to 40 GHz. It operates like two independent R&S®NRVS power meters in one instrument performing simultaneous measurements and exchanging data with each other. The two channels can be set separately so that two completely different measurements can be carried out at the same time. The two measured values can also be related to each other for readout of reflection coefficient, SWR or return loss, for instance. Measurement results are displayed with selectable resolution on a five-digit LCD with adjustable backlighting. The values measured in the two channels or one measured value plus an additional item of information are displayed. The NRVD measures pulse-modulated RF signals like the NRVS. Additionally, the modulation depth of amplitude-modulated signals can be determined from the power variation. After entering the source matching, the expected uncertainty for thermocouple power sensors can be displayed. It supplies a highly accurate, low-distortion 50 MHz signal of 1 mW (0 dBm) power for checking the sensors. Each measurement channel has an analog output wiht selectable scaling for connection of a recorder or for control purposes. Simple automatic test routines can be implemented with the aid of the trigger input and the ready output. Another input serves for taking up the frequency-proportional DC voltage from a sweep generator for tracking frequency-response correction.